A new archery-based Christian ministry is starting in Jackson County to teach youth and families the fundamentals of the sport and to help them grow in their relationship with Jesus Christ. On Target for Christ is a new ministry started by Marty DeVader of Holton, members of Holton First Baptist Church and other community members that is set to launch in January. DeVader said his life was changed by having a personal relationship with Jesus Christ and his involvement with Wanamaker Woods Church in Topeka. “We started On Target for Christ there and then John Motto and David Ent (both of Holton) brought their kids to be a part of it,” DeVader said. The men agreed that the program would go over well in Jackson County and have been seeking donations and organizing the program since April. A board of directors for the ministry was formed, and On Target for Christ received donations and grants for the purchase of equipment from the Justin Corbet Foundation (www.justincorbetfoundation.com), Miller Construction, Greive Construction, Lifetime Eye Care and the Holton First Baptist Church. 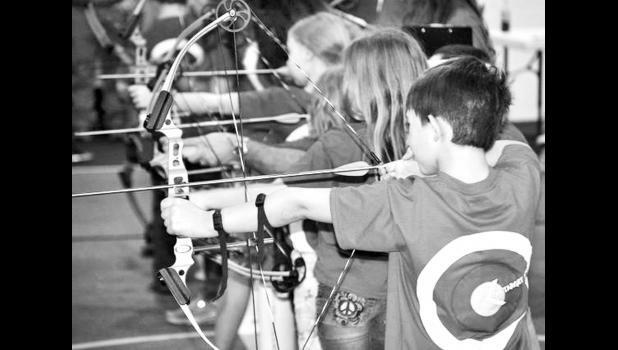 On Target for Christ will meet every Saturday morning for nine weeks at the Holton First Baptist Church, 404 Juniper Dr. Each lesson lasts an hour and a half and will include a 30-minute Bible lesson followed by an hour of archery fundamentals. The final week of the session is reserved for a group tournament. The sessions are open to anyone from first grade to adult, and the men noted that many families work through the program together. Two local children who have worked through the archery program, Jalee DeVader and Dalton Ent, have competed in the Ad Astra State Tournament in recent years and placed first and second, respectively. DeVader and Motto said that archery teaches kids many life lessons. DeVader said he has seen the program help children gain confidence and refocus on the right things. Currently, the program has five instructors, but the men are looking for at least 10 more. Certification training for instructors is being held from 5 p.m. to 9 p.m. Dec. 1 and Dec. 2 at the Holton First Baptist Church. “Archery is just a tool that we are going to use to bring kids to Christ or bring them closer to Him,” Motto said. There is a $20 charge for workbooks, shirts and snacks for the nine-week session, but some scholarships are available. For more information, or to sign up for the first session, visit www.ontargetforchrist.net or call DeVader at 785-410-1089, David Ent at 785-207-0784 or John Motto at 785-554-4687.